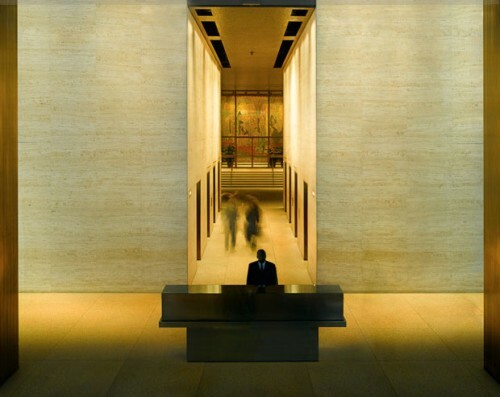 For the past eleven years, photographer Jesse David Harris has had unfettered access to two of the most architecturally significant buildings in New York: the Seagram Building and Lever House, both owned by RFR Holdings. As staff photographer for the Lever House Art Collection he began to shoot the Seagram Building with deference to Ezra Stoller. The photographer’s familiarity with the building evolved alongside technology. Last year, Harris began a time-lapse project that reflects his time with Mies van der Rohe’s masterpiece. The project took ten days to shoot over the course of 8 months on a Canon 5D MarkII. Harris bounced between a 17mm and a 24mm tilt-shift lens. Three streams of bracketed exposures were edited during four months of postproduction. To achieve the stunning effects in the film, the photographer designed a time-lapse dolly with a slow servomotor that gently pushed the camera along a forty foot track. The time lapses ranged from four to 24 hours. It’s not the first time that the Seagram has received this time lapse treatment. The late urbanist William Holly Whyte used time-lapse recordings of the building’s plaza to hash out theories on the use of public space for his landmark book and film, The Social Life of Small Urban Spaces. Harris and Whyte shared the same elevated vantage point from which to observe the flurry of activity in the plaza below. Harris’s work seems to buttress Whyte’s appreciation of a “friendly kind of congestion” that forms on Seagram’s plaza. Until recently, people were often swept away from architectural photography as blemishes obscuring the masterpiece, but Harris’s film takes a kind of Satyagraha joy of people in motion.